December 2017. On a flight home for Christmas, I started reading Hillary Clinton’s latest book, ‘What Happened’. When I packed my luggage the night before, I thought that would make perfect holiday reading. Except that nobody told me the first hundred pages were going to be the most heart-wrenching read ever. I spent the three hours of my flight sobbing like a baby. The book starts with the inauguration and the first 24 hours after the election. Two days we’ve all lived, just this is through her eyes, the first female candidate to the presidency who lost to the least competent candidate in the history of the US. Fast-forward half a year. I am on a plane from New York City to Europe. The lady next to me is reading the same book and, like me, sobbing her way through it. We started talking. She was not into politics, but she could relate to her story, the fight, the dream, the struggles, the loss. This is a book that touched me in so many different ways, I can’t even remember the last time I cried while reading a book. Over the last year, I have recommended it to everyone I crossed paths with, men and women, American and not, following politics or not interested at all. Because I believe there is something for absolutely everyone in there. She shares an intimate and authentic view of the journey, the night, the day after, the months after. You’ve probably all witnessed her day after speech. With grace and power and the largest smile ever, she pulled out the most amazing, emotional and empowering discourse, managing to comfort and inspire a whole room of campaign people crying their hearts out and a whole world of people glued to their TVs. I’ve watched it many times since, and that, my friends, is a speech that history will remember. If you ever feel down, lack motivation, don’t really feel like getting out of bed, watch it – if she could do that, you can do anything! HRC 2016 was history in the making, and a history we’ve all lived. That day and night of momentous politics, leading to the biggest shock in modern era polling and politics have left very many of us in disbelief and with more questions than answers. 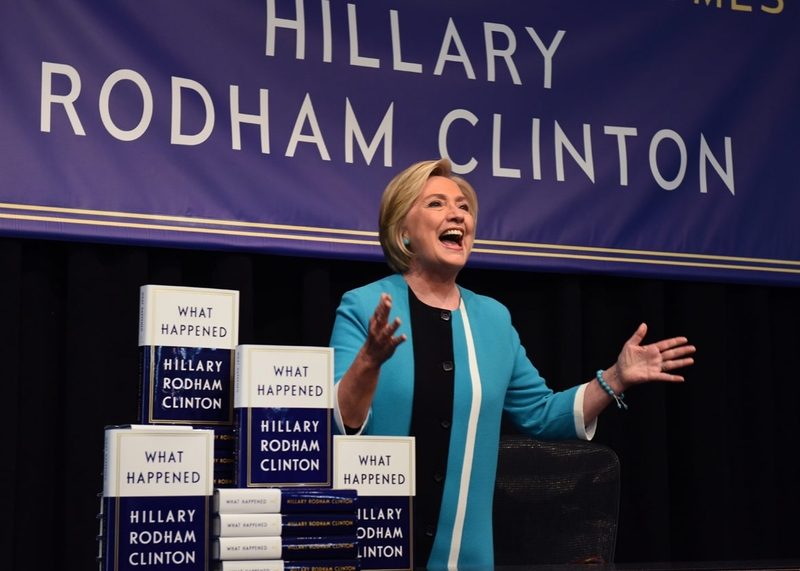 Hillary doesn’t attempt to answer all those questions, but she’s aiming at showing you a side you may not have known and what it ultimately means to be a woman running against the hardest glass ceiling on the planet. I believe the fact that there are record numbers of women running for elections now is partly her legacy. I invite you to read it. At the very least, you will be touched and will be able to relate to the experience of being a woman, the kind of woman that rebels against the times and breaks the conventional rules. At the most, you may find it, like me, life-altering. It will drive, motivate and guide you to dream big, aim high, fight the fight and do all the good you can on this planet. I’ve gone back to that book many times since I read it. For comfort. Or advice. Or hope. Or motivation. Or understanding. And I can’t wait to discuss it with you, and your amazing wonderful powerful selves, who are rocking at life and leading the way for the next generation of girls to have more opportunity and real equality. I’m planning a November night fireside chat about it – think red wine, red cheeks and a fab chat about a beautiful book. I hope you will join us at #GWCBookClub. Stay tuned and don’t hesitate to add this book to your night table stash.